Priority Club has a new 10K bonus points offer for stays of three nights or longer at Holiday Inn Club Vacations locations. This offer is valid for stays between March 1 and May 31, 2013, that are booked by May 27. You can access Priority Club web page for this offer here . There are only TEN Holiday Inn Club Vacations locations and all are located in the United States. You can find the list below and access the website for this Holiday Inn brand here . The usual rate search will bring up all the rates. The lowest rate is Club Saver rate of $102, Getaway rate of $105, Best Flexible Rate of $112.33 and then this 10K bonus points rate of $119.33. All these are per night rates and note this particular location also charges a resort fee of $7.95/night. This bonus points package rate SHOULD count for status, although likely won’t automatically. The rate is bit inflated, but can make sense. Must be a Priority Club® Rewards member or enroll for free. Bonus points will be awarded for stays of three (3) or more consecutive qualifying nights between March 1st 2013 and May 31sth 2013 at any Holiday Inn Club Vacations® resort. 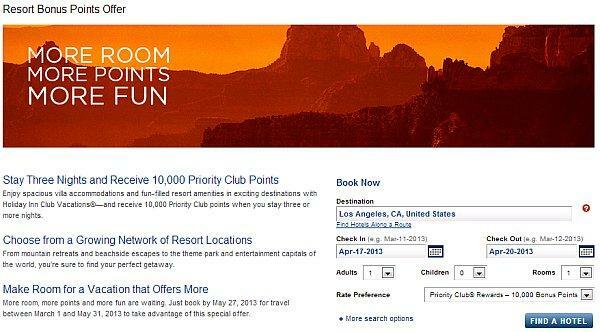 Guests must book their qualifying reservation through IHG channels (brand websites or call centers) by May 27, 2013 to become eligible for the 10,000 bonus points. Guests who book in any other way, including directly with Holiday Inn Club Vacations, will be ineligible. Guests are required to pay a first night deposit at the time of booking and any cancellations must be done 3 days prior to arrival date or there is a first night penalty. Bonus points will be deposited once the stay has been completed. A stay is defined as one night or consecutive nights at the same hotel, regardless of frequency of check-in/out. A stay is qualified when paying qualifying rates, which include most business and leisure rates. Only one room per member per stay will be awarded the applicable bonus points. No retroactive bonus points will be awarded for stays prior to the promotional period. Subject to standard Priority Club Rewards Membership Terms and Conditions. This exclusive offer is valid for original recipient only.